Jesus tells His disciples to pass the food among the hungry people. From a boy's small lunch, there was miraculously enough for all, with some left over. The disciples whom Jesus sent to preach in the towns and cities of Galilee had returned joyfully, telling their Master about their success in healing the sick and in casting out the evil spirits just as they had seen him do. And now the fame of Jesus was increasing every day, and many more people from distant parts of the country were flocking to hear him. So urgent were the people who came to hear Jesus and to have their loved ones healed, that they pressed constantly upon him, and allowed no time for him to rest or even eat. Then Jesus called his twelve disciples aside from the multitude and said, "Come with me to a quiet place, for we must rest a while." Taking a ship they sailed away from the multitude to the other side of the Sea, and went into a desert place near a mountain. But they did not find much time to rest even in this lonely spot, for soon they saw a great throng of people coming toward them. The multitude had followed from the other side of the Sea. Perhaps the disciples were disappointed because the people had found them again, but Jesus looked pityingly upon the great throng, and said of them, "They are like sheep that had no shepherd. They wander about here and there hunting for their own pasture-grounds." In this great throng were five thousand men, who had come from different parts of Galilee. Some of them had brought their wives and children along, and other women had come, too. When they had started they did not know they would have to go so very far to find Jesus, and many of them had brought nothing to eat. One boy, however, had not forgotten his lunch-basket, and in his basket he carried five little loaves of barley bread and two small fishes. When the multitude came near, Jesus received them kindly and sat down to teach them again. He healed the sick ones whom they had brought to him, and taught them many things about the kingdom of heaven. After a while the day wore on and evening came. Still the people lingered near, seeming to forget they could find no food or shelter in the desert place. The disciples grew impatient with them and came to ask Jesus to send them away. "They have brought no food," said the disciples, "and we can not supply food for them in this wilderness; therefore send them away that they may buy food in the towns and villages as they journey home." But Jesus answered, "We must feed them before sending them away." Then, turning to Philip he asked, "Where shall we find bread, that all these people may eat?" Philip looked at the great multitude and shook his head. "If we should buy two hundred pennyworth of bread," he answered, "there would not be enough for each one to have a small piece." While Jesus and the disciples were discussing what to do, the boy who had not forgotten to carry his lunch came near and heard their conversation. 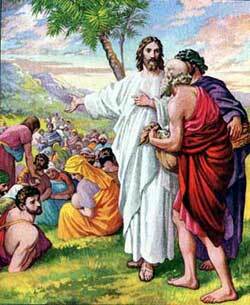 Then he showed his basket of food to one of the disciples, and he offered to give the food to Jesus. The disciples, who was Andrew, came and told Jesus what the boy had said. "How many loaves are there in the basket?" asked Jesus. Andrew said, "Only five and two small fishes. But what will that be among so many people?" Jesus replied, "Bring them to me." Then he told his disciples to bid the people sit down in groups, in some fifty and in others a hundred, and wait for their evening meal. While they waited, he took the little loaves and the fishes and blessed them and broke them into small pieces. He filled a basket for each of the twelve disciples and sent them to pass the food among the hungry people. Then the disciples returned and again he filled their empty baskets. When all the people had eaten, he sent the disciples to gather up the scraps that had been left over, and they found twelve baskets full of scraps. And every one in the great multitude had eaten enough to satisfy his hunger. The boy who had brought the lunch-basket to Jesus had all that he could eat, and he shared his little lunch with every one in the great throng because he had let Jesus bless his offering. This unusual miracle caused much excitement among the people. They wanted Jesus to become their king instead of letting the Roman government rule them any longer. They believed that he could set them free from the rule of the Romans, whom they hated. They thought it would be wonderful to have a king rule them who could feed them by working miracles. But Jesus would not allow the people to take him for their king. Although he was a King, yet he had not come to earth to rule an earthly kingdom. He commanded his disciples to enter their ship at once and return to the other side of the Sea. And when they left him, then he dismissed the multitude and went alone upon the mountain near by to pray.